The interesting wildlife in Okinawa is not just limited to those creatures with fins and gills. If getting into the sea seems too daunting a prospect as the cooler winter months approach, then grab a pair of binoculars and go out and find some of Okinawa’s feathered friends. 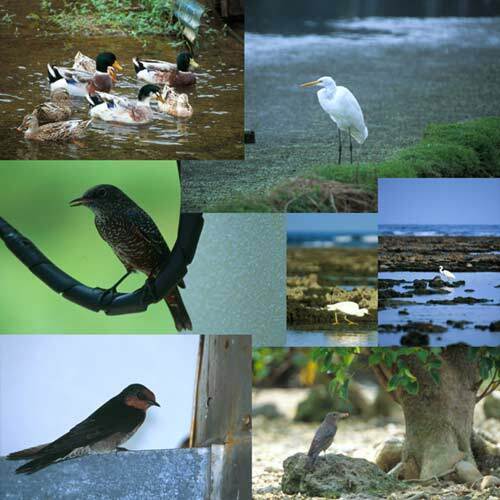 Although you can find birds anywhere in Okinawa, there are certain areas that are particularly good for birdwatching to which you are recommended by local “twitchers.” In the south of Okinawa you have the Manko, tidal flats near Naha where you can nearly always see various kinds of egrets and grey herons. Egrets are one of the easiest birds to spot due to their large size, bright white feathers and sentry-like stance, standing on pencil-thin legs out in the middle of the muddy banks. Along the southern coastline from Itoman east to Tamagusku you can see herons and egrets along with smaller plovers and dunlins scouring the rock pools at low tide for food. In the north of Okinawa you have the rice fields of Kin Town and Kijoka. These farming areas have a greater variety of birds that seem less nervous about humans getting close due to the regular presence of people working in the fields. Further north again in Yambaru you find the greatest diversity of birds as well as rare and endemic species. The Pryer’s woodpecker and the Okinawan rail only live in Yambaru and have been designated National Endangered Species of Wild Fauna and National Specified Protected Animals of Japan. The Okinawan rail, which was just identified as a new species in 1981, can barely fly and instead runs quickly away at the first sign of danger. The fact that it has managed to survive at all is thought to be due to the lack of predatory mammals, such as the Iriomote wild cat, in its habitat. Birdwatching requires very little equipment, but a pair of binoculars and a bird book are good investments. A field guide to the birds of Japan published by the Wild Bird Society of Japan is the best and most comprehensive book I have found. Its clear illustrations make trying to identify the small brown feathery thing you are looking at a little easier. There are a huge variety of binoculars on the market, ranging from the tiny opera-style ones that fit in your pocket to mammoth-sized pairs that need to be mounted on a tripod to hold them steady. The prices also vary from a few thousand yen to a few thousand dollars, so there is a large range to choose from. Some modern binoculars also have zoom capabilities and extremely high magnification, making the decision even harder. Zoom lenses allow you to use a low magnification to find what you are looking for and then increase the magnification to get a more detailed view. Very high magnification models sound like a good idea, but it is usually very difficult to hold them steady, resulting in a blurred image. In general, binoculars with eight or 10 times power are best for most purposes. The other main difference is the diameter of the lenses used in the binoculars. Larger diameter lenses will produce brighter, clearer images but will also make the binoculars heavier and bulkier. Major Japanese manufacturers such as Canon and Nikon produce excellent lenses that should provide many years of faithful service in the field. The most important thing to have when birdwatching, however, is patience. When you arrive at an area, the birds are often skittish and fly away. Sitting and waiting for half an hour is normally enough time for the birds to return and get back to searching for food. Sitting or crouching rather than standing will make your presence less alarming to the birds and, surprisingly, sometimes it’s best to just remain in your car. Some birds do not seem to be concerned by a profile or vehicle noise, and you can get closer to many species just by rolling rather than strolling up to them. I personally would recommend finding a nice patch of soft grass, taking along a thermos and then just sitting back and seeing what flies by.